This is a fascinating, unusual and original sort of book, poking as it does into little-searched corners of British social and scientific history, in a suspenseful exploration of an 1833 real-life poison murder mystery. 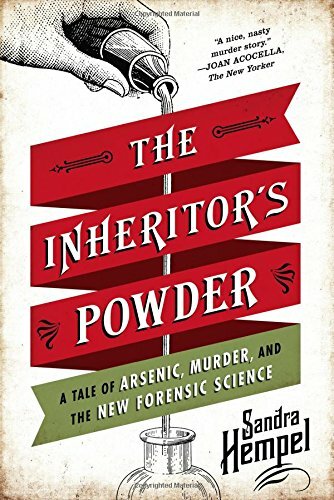 Sandra Hempel has chosen to present both the story of that particular case and the more general tale of forensic toxicology in its infancy, beginning the book with the former and then pulling back into a survey of the state of science and of social mores from the mid-1700s into the Victorian era. (Victoria ascended the throne in 1837, and occasionally Hempel looks beyond the 1833 case to give us a sense of where science was going, and to put the science of the time in context.) Hempel shifts often, chapter by chapter, between the dramatic events at the house of the richest man in Plumstead, Kent, and the lives and scientific concerns — and frustrations — of the men obliged to investigate those events and to bring, if they could, a murderer to justice. There are many benefits to giving the material this sort of treatment, which is a bit like looking at a bird through binoculars and then putting them down to scan the tree it’s in and the forest beyond. The reader gets a strong sense of place and time, the limitations that scientists were labouring under, the sometimes irrational assumptions of the period, the frightening prevalence of disease and the ignorance of doctors about it, and the character of life in this largely pre-industrial world. Players that would otherwise be simply names come alive as people — who, unlike us, did not have the advantage of hindsight. The downside of this shifting, back-and-forth focus is that it risks derailing the narrative drive: instead of finding out more about what the inquest found, we have to hold our horses while we learn about diseases that mimicked arsenic poisoning, methods of testing for arsenic in large quantities (arsenic is naturally present in the ground, in spring water, in food, and in our own bodies), and the careers of the various medical men and chemists involved one way or another in toxicology. Perhaps certain details could have been omitted — do we really need to know the names of a chemist’s two daughters, who don’t figure in the story at all? — and perhaps some of the scene-setting could, ever so slightly, have been streamlined. It only takes a little bout of impatience for a reader to be tempted to criticize the approach to the whole project, which is what many reviewers on Goodreads have done. But I think the approach is a sound one, and the book overall is certainly worth the time of anyone even remotely interested in the subject of toxins, criminal law, and advances in early science. In the end, the right proportion of energy spent looking at the broader scene instead of directly through the binos is a matter of personal preference. I might have done one or two things differently, but I highly recommend the book.